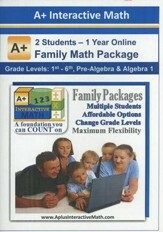 The A+ Interactive Math Family Package (2 students) provides multiple students with a full year of the A+ Interactive complete online curriculum. A+ Family Packages offer parents the ability to access all grade levels for their students - - including the flexibility to move them back and forth from one grade level to the other! Perfect to help parents identify and close learning gaps or to move students ahead into the next grade level, A+ Interactive curriculum is the ideal way to provide customized math instruction. Levels in which parents may place their children include K/1-Grade 6, Pre-Algebra, and Algebra 1. A recommended weekly lesson plan covers approximately 30-32 weeks. Students usually cover three lessons per week, and should expect to spend 3-4 hours each week completing the material. A chapter test is provided once all the lessons in the chapter are done. The A+ Interactive Math Family Package (3 students) provides multiple students with a full year of the A+ Interactive complete online curriculum. A+ Family Packages offer parents the ability to access all grade levels for their students - - including the flexibility to move them back and forth from one grade level to the other! Perfect to help parents identify and close learning gaps or to move students ahead into the next grade level, A+ Interactive curriculum is the ideal way to provide customized math instruction. The A+ Interactive Math Family Package (4 students) provides multiple students with a full year of the A+ Interactive complete online curriculum. A+ Family Packages offer parents the ability to access all grade levels for their students - - including the flexibility to move them back and forth from one grade level to the other! Perfect to help parents identify and close learning gaps or to move students ahead into the next grade level, A+ Interactive curriculum is the ideal way to provide customized math instruction. The A+ Interactive Math Family Package (6 students) provides multiple students with a full year of the A+ Interactive complete online curriculum. A+ Family Packages offer parents the ability to access all grade levels for their students - - including the flexibility to move them back and forth from one grade level to the other! Perfect to help parents identify and close learning gaps or to move students ahead into the next grade level, A+ Interactive curriculum is the ideal way to provide customized math instruction. The A+ Interactive Math Family Package (9 students) provides multiple students with a full year of the A+ Interactive complete online curriculum. A+ Family Packages offer parents the ability to access all grade levels for their students - - including the flexibility to move them back and forth from one grade level to the other! Perfect to help parents identify and close learning gaps or to move students ahead into the next grade level, A+ Interactive curriculum is the ideal way to provide customized math instruction. The A+ Interactive Math Family Package (10 students) provides multiple students with a full year of the A+ Interactive complete online curriculum. A+ Family Packages offer parents the ability to access all grade levels for their students - - including the flexibility to move them back and forth from one grade level to the other! Perfect to help parents identify and close learning gaps or to move students ahead into the next grade level, A+ Interactive curriculum is the ideal way to provide customized math instruction. Printable worksheets and exams allows flexibility.